Now highlight the above piece of R code and copy and paste it into your console; look carefully at what you’ve pasted. A new line has magically appeared. Due to some sneaky CSS magic, I was able to hide the message() statement. If I was evil, I could have changed this to a system, source, or any other command. The CSS code simply sets the message() function to the background color, changes the font size and makes it un-selectable (see this post for details). So remember, be careful with your copy and pasting! To quantify the impact of the CPU on an analysis, I created the package benchmarkme. The idea is simple. If everyone runs the same R script, we can easily compare machines. The above graph plots the current benchmarking results for writing a 5MB file (my machine is relatively fast). and upload to the webpage. When discussing how to speed up slow R code, my first question is what is your computer spec? It always surprises me when complex biological experiments, costing a significant amount of money, are analysed using a six year old laptop. A new desktop machine costs around £1000 and that money would be saved within a month in user time. Typically the more the RAM you have, the larger the dataset you can handle. However it’s not so obvious of the benefit of upgrading the processor. 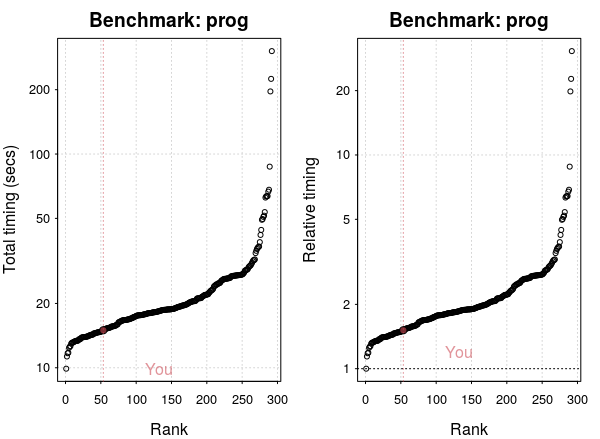 To quantify the impact of the CPU on an analysis, I created the package benchmarkme. The aim of this package is to provide a set of benchmarks routines and data from past runs. You can then compare your machine, with other CPUs. The benchmark_std() function assesses numerical operations such as loops and matrix operations. This benchmark comprises of three separate benchmarks: prog, matrix_fun, and matrix_cal. If you have less than 3GB of RAM (run `get_ram()` to find out how much is available on your system), then you should kill any memory hungry applications, e.g. firefox, and set `runs = 1` as an argument. My laptop is ranked around 50 out of 300. However, relative to the fastest processor, there’s not much difference. 2. A summary of your system information (get_sys_details()). Recently Steph Locke asked on twitter if there was a list of R conferences. After some googling, all that I came up was a list of useR groups maintained by Microsoft. While the list was lengthy, it was missing a few groups (and twitter handles). So the other night I created a github repository listing conferences/groups. If you spot any missing groups or conferences, feel free to make a pull request at the GitHub Repository. Over the next two months I’m running a number of R courses at Newcastle University. Since these courses are on advanced topics, numbers are limited (there’s only a couple of places left on Predictive Analytics). If you are interested in attending, sign up as soon as possible. Getting to Newcastle is easy. The airport is 10 minutes from the city centre and has direct flights to the main airport hubs: Schiphol, Heathrow, and Paris. The courses at Newcastle attract participants from around the world; at the April course, we had representatives from North America, Sweden, Germany, Romania and Geneva. Onsite courses available on request.